This is a 17ft 1964 carver comandor. It is my first boat project. I purchased this boat a few years ago and completely refurbished the boat and trailer. The engine is a 1964 90 s series electric shift. This engine is untouched (original paint). As you can see from the photos this boat was used very little or well maintained. Yes i am considering selling it. I have only used it a few times runs and drives great . 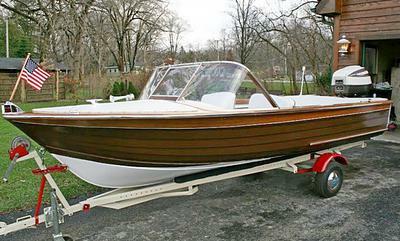 But looking for a nice old chris craft to restore. I can imagine the 90hp moves it pretty good. After you run a few more times, any idea on want you want to get for it? Yes i think i would sell it! I have used it a few times runs and drives like a dream. Really want to use it a few more times . But wanting a wooden chris craft to restore. I would be interested in purchasing. We have Peterborough Royal 1964 16foot x62inch cedar strip bull nose with original hardware. We are fixing it up and hoping to also sell :) looking forward to seeing your next project. Very good job of restoring. Good to see a wood boat brought back to excellent condition.